Captain Jimmy launches his boat and uses the facilities at Scipio Creek Marina. It’s at the marinas’ store where you can purchase anything you need or may have forgot before you embark on your adventure. Restrooms available for your use before and after your long trip. Adjacent next to Scipio Creek Marina is Roberts fish cleaning hut where you can have your fish cleaned if you choose. Roberts cleans for all fishing guides customers, offshore boats, and individual boat owners. He skins, filets, debones and bags at a reasonable rate. If traveling from Georgia, Tallahassee, Carrabelle, St.George Island, etc., going westbound on Hwy 98 to Apalachicola. When you come off bridge into downtown Apalachicola continue straight ahead 2 blocks and go underneath YELLOW blinking caution light onto market street, CONTINUE on 1 mile. Scipio Creek Marina is on the right with big parking lot. The sign is on big dry storage building SCIPIO CREEK MARINA. You can see it all the way from blinking light. So, in other words, come off bridge go straight ahead approx. 1 mile to marina. If you’re traveling from Alabama, Panama City, Port St. Joe, Cape San. Blas, Indian Pass, Etc., going eastbound on Hwy 98 to Apalachicola, go to the RED Blinking Caution Light downtown in Apalachicola. 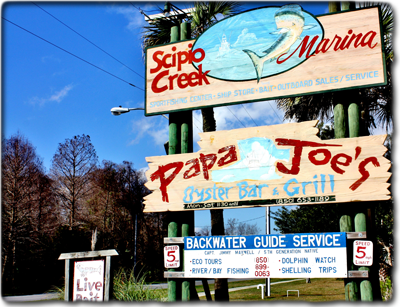 Take left turn off Hwy 98 onto Market Street and continue approximately 1 mile and Scipio Creek Marina will be on the right with big parking lot. (When you turn left at red blinking light, look down road and you will see SCIPIO CREEK MARINA on big dry storage building).